Here it is. 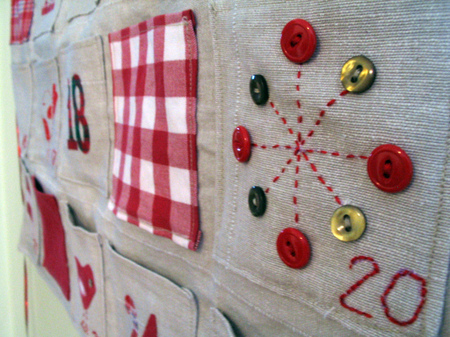 The finished advent calendar - only a day late! (the bell on the ribbon is to mark what day we're at). I've been thinking about making one for the past few years and have found so many inspiring and orginal handmade versions recently that I had a hard time deciding what I wanted to make. The children have been cheated out of missed out on their December 1st advent gift but I don't think they even noticed. We were planning a trip to the Santa parade in a nearby village but considering the temperature was -20C (yes, you did read that right!) with the wind chill, we decided to abandon the idea. We're expecting 2ft of snow in the next 24 hours. Gulp! just beautiful. I love the colors, just the right amount of details on the numbers (with room to add more of course, if you wish). Definitely a treasure your kids will love! wow, thats cold, and a lot of snow, we had weather like that when we lived in Boston, I don't miss it! Your calendar is stunning and inspiring! I love love love it! 2ft of snow??? Oh my! If flurries are in the forcast where I live, we buy all of the milk and bread we can. A few inches and we hole like it is a blizzard. enjoy the snow - dig in! Hi, Lina! 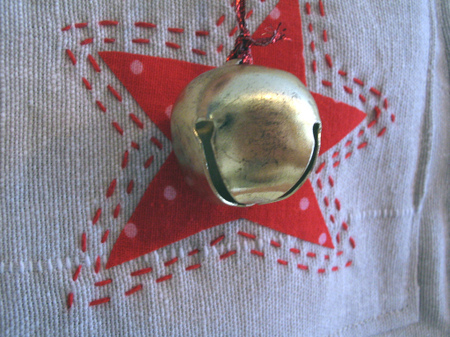 Thank you for sharing this photo with the Handmade Holidays photo pool. I was wondering if we could post a photo of your wonderful calendar with a link back to your blog on the Sew Mama Sew blog? Please email me. Just absolutely gorgeous! You clever thing! That is fabulous - how lovely. Hope you can enjoy the snow. We never get more than an inch or so but everything stops - schools close and people panic-buy. I love the thought of being snowed in for a few days (with plenty of coal for the fire). Claudia in Montreal under 2 ft of snow! eek - that is a lot of snow - I can enjoy it when it happens to somebody else! Your calendar is delightful and I hope that the Christmassy surprises in every pocket create lots of fun and excitement. today i think i am doing a new "calendar", so my kids will have to miss out on a few days.. The calendar is adorable! Great work! Having looked at them all I think yours is magnificent (and dare I say it, the best). I saw that pic on MollyChickens too and wondered whether to make one but my children are quite attached to the slightly tacky one we've had for twelve years or so. Never mind - I'm sure I can think of something else to spend my time on. Wow--just gorgeous! A true family heirloom for sure. Good work. I love the little details on each pocket. That is so great - good job!! Your Advent calendar is lovely. I just ordered that magazine because of the Advent calendar in it, but I love the colors you used in yours. Maybe next year I will have one completed. I am absolutely love this Advent. Great job and I love the bell. I was not ambitious enough this season to pull one off, but I have been wanting to for years. I will be producing something like this for next year. I think the key is to start before Nov. 30th!! 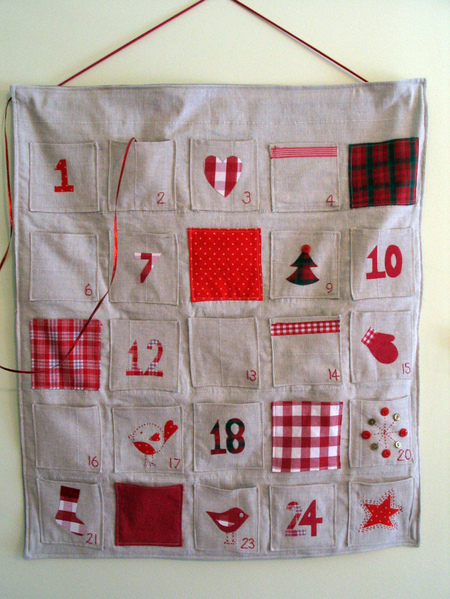 I love advent calendars and this one is adorable! It's a wonderful keepsake - love the colors...a family heirloom! I love this! I'm wondering what type of fabric you used? This is so beautiful! I am really inspired now to make one for next year. Thanks for sharing! !